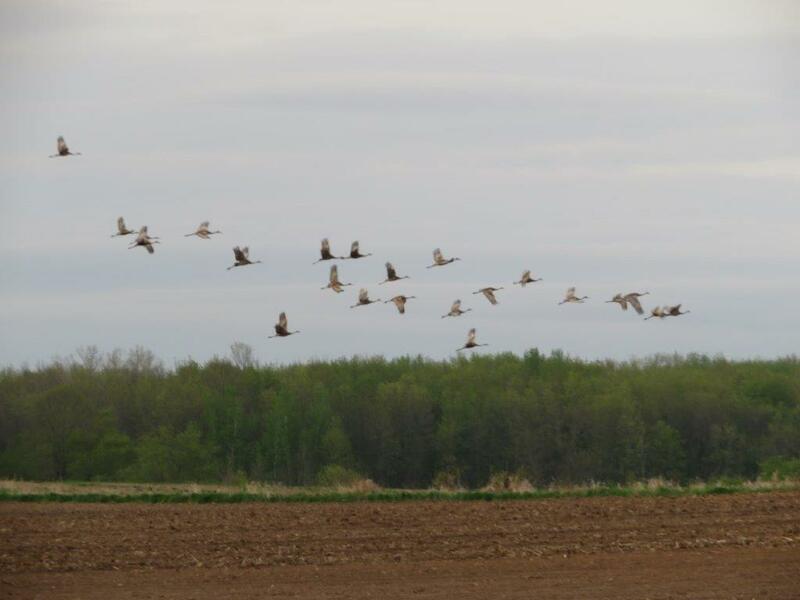 "Farmers need our help to deter cranes and geese from predating on their corn and snap bean fields. Our bold, high-energy, turkey dogs are ideal for the job. 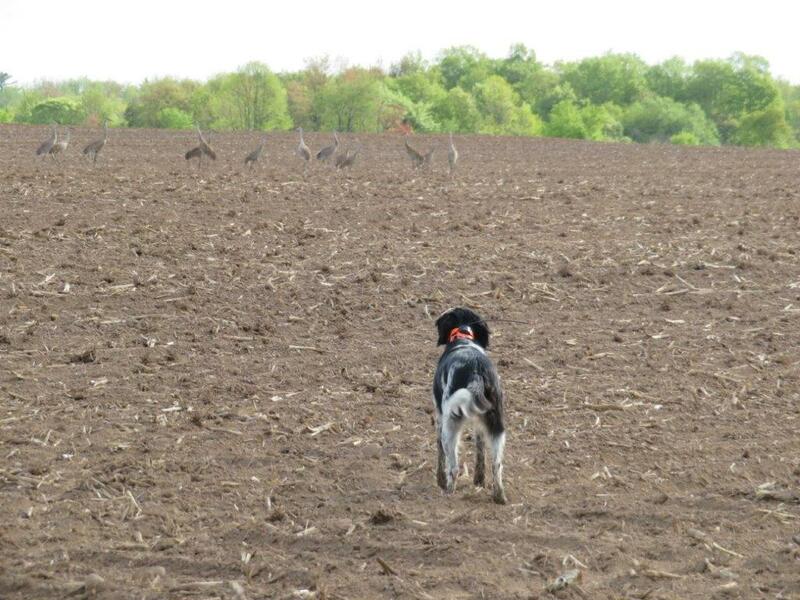 Of all the upland bird dogs, only owners of turkey hunting dogs will permit them to flush cranes and geese in the spring. 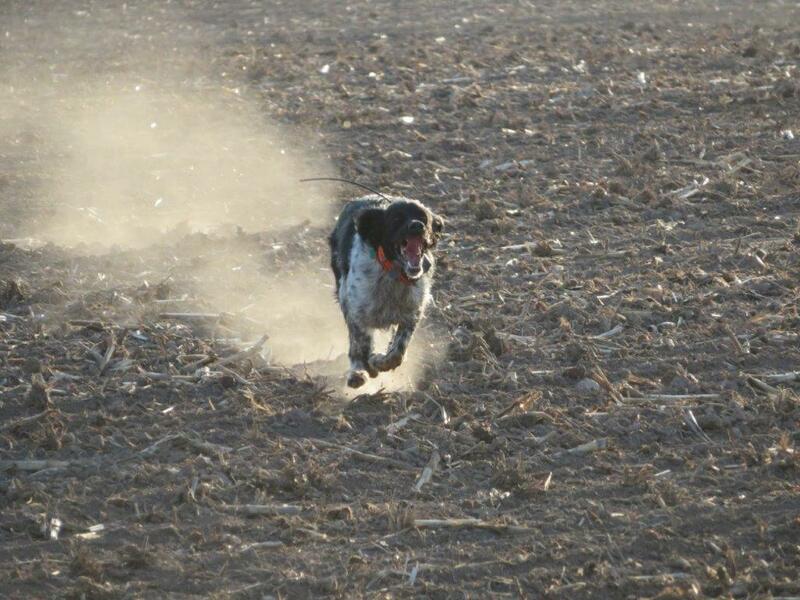 While there are other upland bird dogs that run big (think field-trial pointers and setters accompanied by hunters on horseback), none of those dogs are trained (or permitted) to flush birds at great distances (they're trained to stand rock-still and point birds). Puppies begin by chasing every fly in the window, then butterflies and everything else that flies, up to the big game of all birds, the wild turkey. Their fascination with the big birds easily extends to cranes. Flushing cranes in the off season polishes their skills for finding and scattering turkeys in the fall. 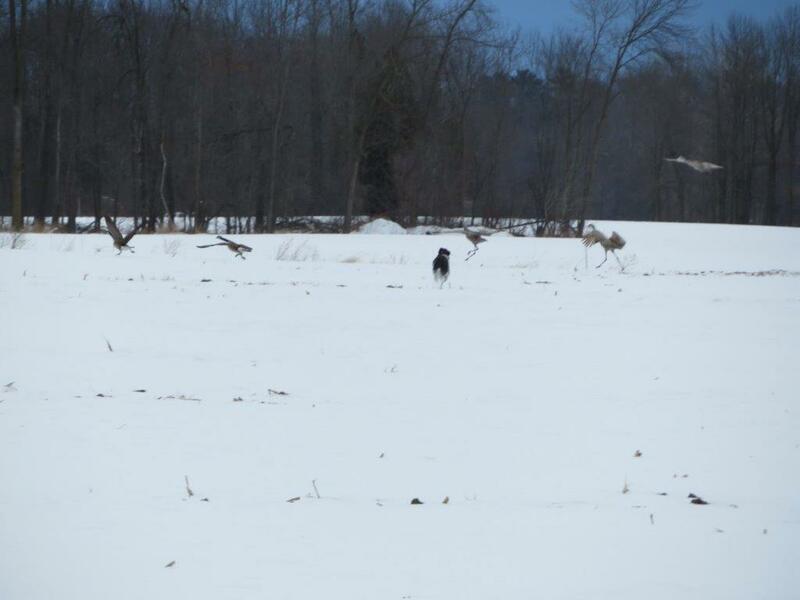 There's nothing more fun for a bird dog than wild turkeys, and then there's cranes. 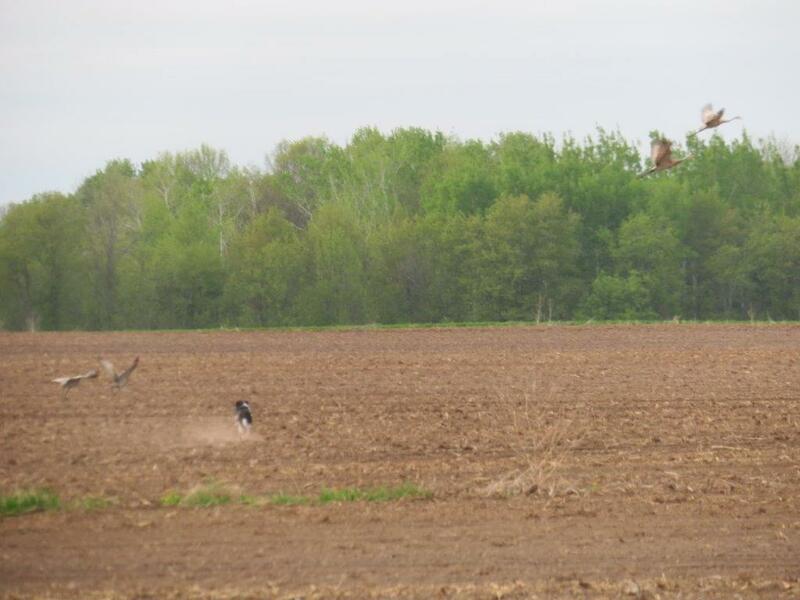 Other than chasing Cranes away themselves, the farmer's alternative is Avipel® (for corn or rice only, there is no chemical remedy for predation on beans, alfalfa or anything else) at $6/acre (2018 Wis. price). These special dogs save farmers the expense. 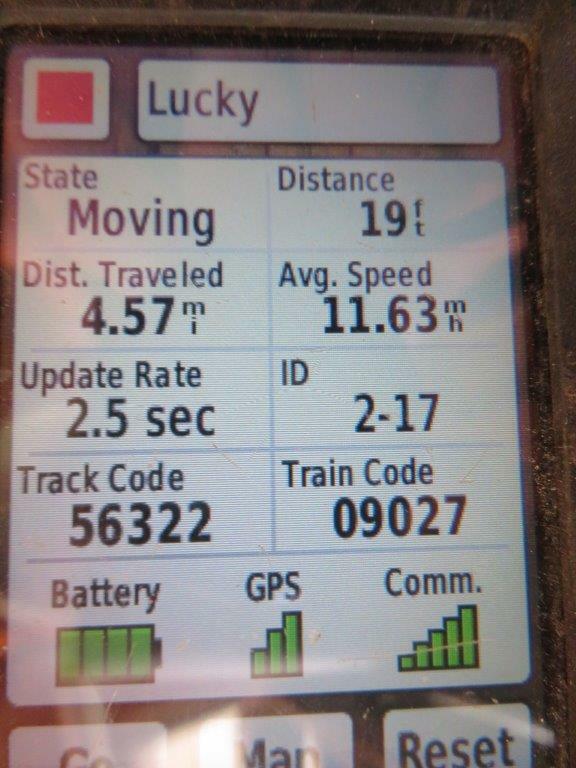 The cool spring weather is ideal for the exercise. In Wisconsin, I started March 23, a good month before cranes nest, until June 7, when the corn is high enough that the kernel was disintegrated. We do this to protect the corn during approximately the first 8 days after it emerges, the only time it is vulnerable to predation from cranes. After that, cranes in corn fields are only eating bugs. 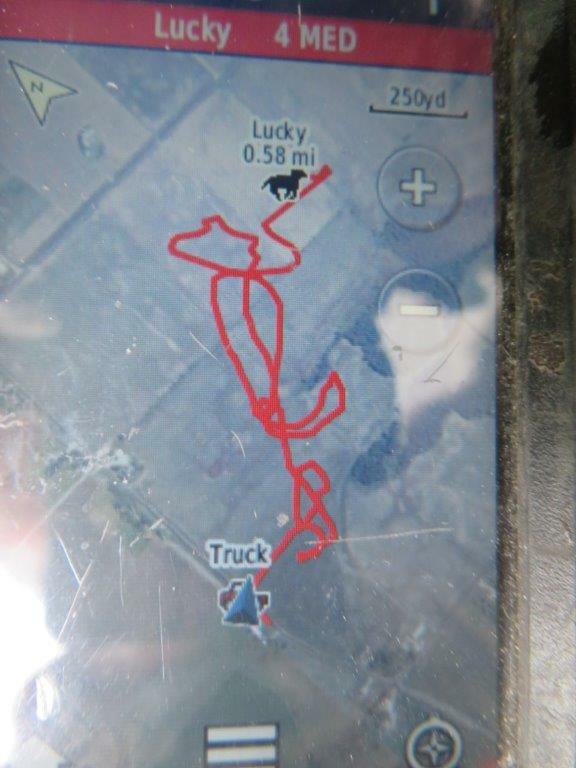 We save cranes by preventing them from predating on the fields. The dog gets rid of her pent-up energy and the farmer is glad to see a fast dog on his fields during the critical period. 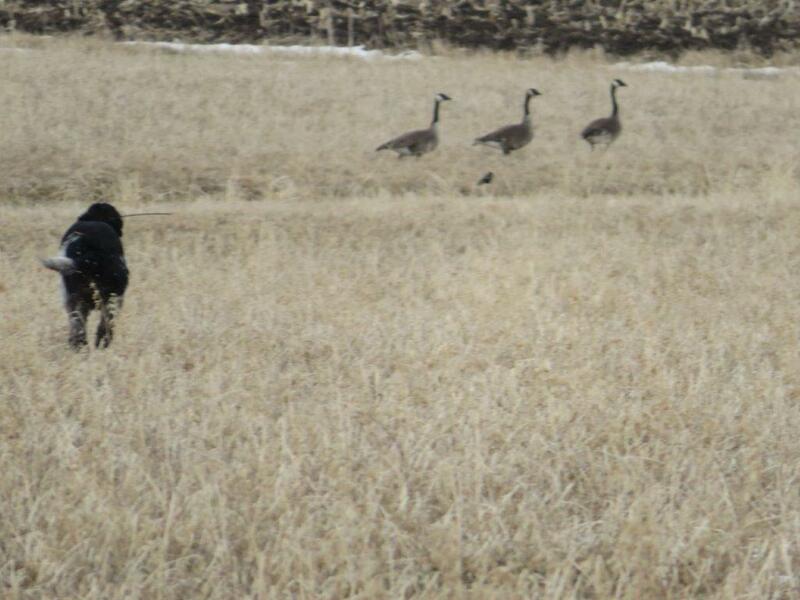 Four pictures at right and left were a trifecta of cranes, geese and turkeys on a particularly vulnerable field. For a few minutes the dog thought she was in heaven. The idea is to discourage the birds from feeding, habitating and especially nesting near the soon to be planted corn fields. 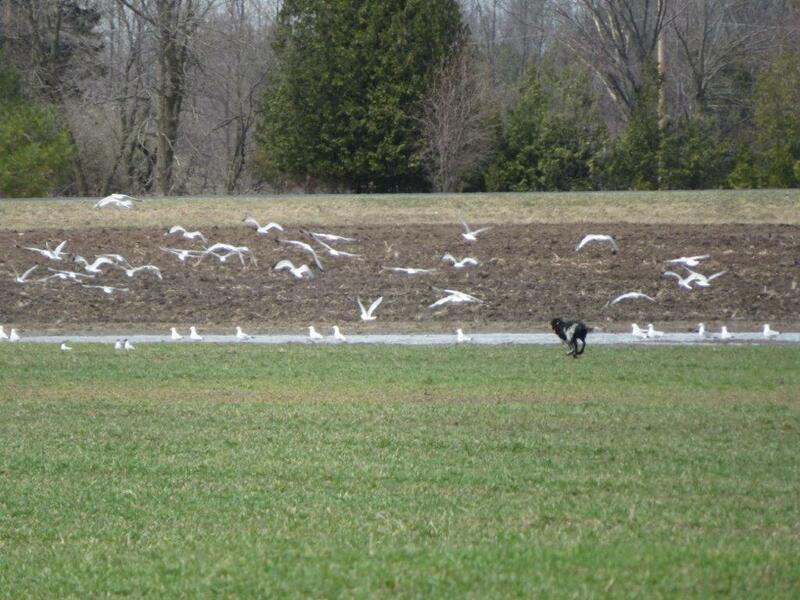 Routinely running your dog in those fields discourages them from using it and encourages the birds to find other fields. A crane can eat on average about 400 kernels of corn per day. Some cranes will not feed in agricultural fields, while other will eat up to 800 corn kernels per day. You can't bother eggs, nests, or young without a permit: "You do not need a federal depredation permit to harass or scare birds, provided (a) birds are not killed or injured and (b) birds sitting on active nests (nests with eggs or chicks present) are not disturbed to the point that it causes the eggs to not hatch or the chicks to die or become injured." The key is starting early, before they select a nest site. Non-territorial sandhill cranes are unpredictable in their habitat use and can disperse across a landscape of 25,000 acres. Dispersed sandhill cranes can quickly congregate into flocks of 50 to 100 birds and cause significant damage in a short time. 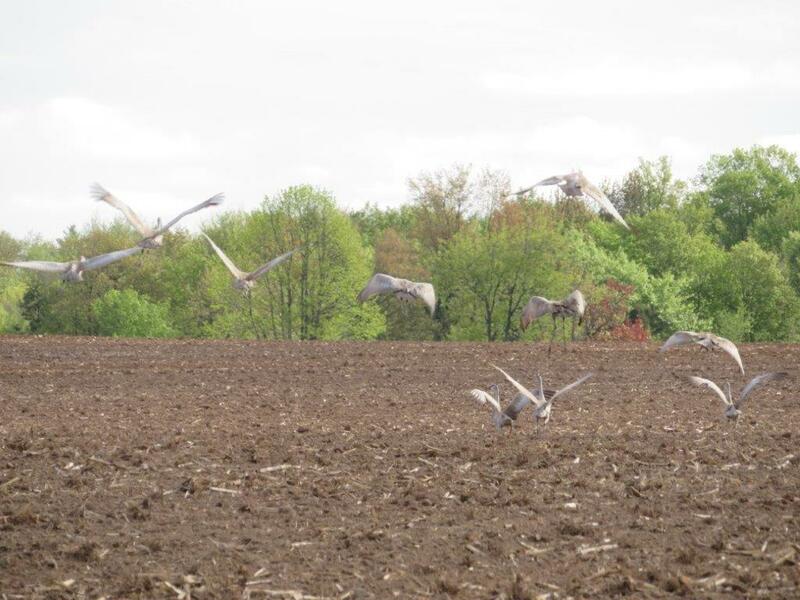 Non-territorial sandhill cranes cause most of the damage to planted cornfields. 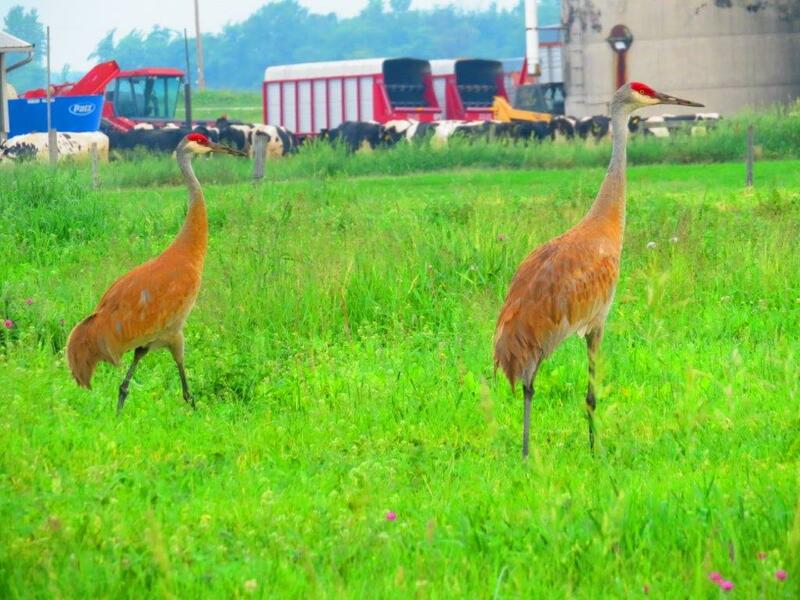 Territorial sandhill cranes seldom cause significant damage because their density is low (but to the farmer, anything is significant at todays prices). 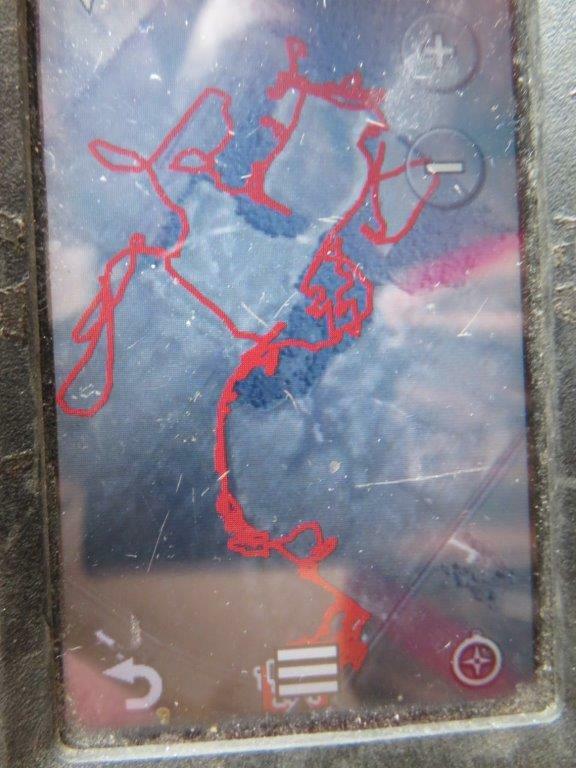 They damage field edges located near wetlands where they are nesting. Sandhill cranes mate for life. They usually lay one or two eggs in heavy cover and incubate them for 29 to 32 days. One parent will always watch/defend the chick (it can't fly for 2 or 3 months), so it can only feed as far as it can walk. Alternating parents may feed on adjacent corn and bring it back to the chick (what we're trying to avoid - nesting near a corn field). Crane chicks can't fly until 67 to 75 days. They remain highly elusive in heavy cover. Chicks are fed by the parents until 2 to 3 months old. Mates trade places every two hours during daylight hours. At night, the female incubates while the male stands guard. Crane chicks eat insects during the spring. Later in the summer, they feed on larger animals along with roots and tubers. Spring turkey season is open during this time, so be considerate. 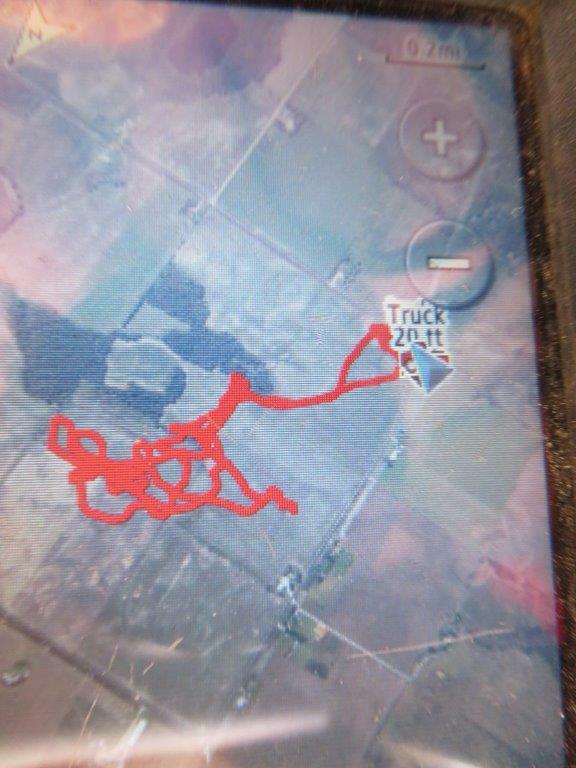 The farmer knows if anyone is hunting his land, when and where. Look out for parked vehicles. If I know they could be hunting, I go later in the morning or early in the afternoon and avoid the weekends, since most people have jobs or school and can only hunt then. It helps to be retired. 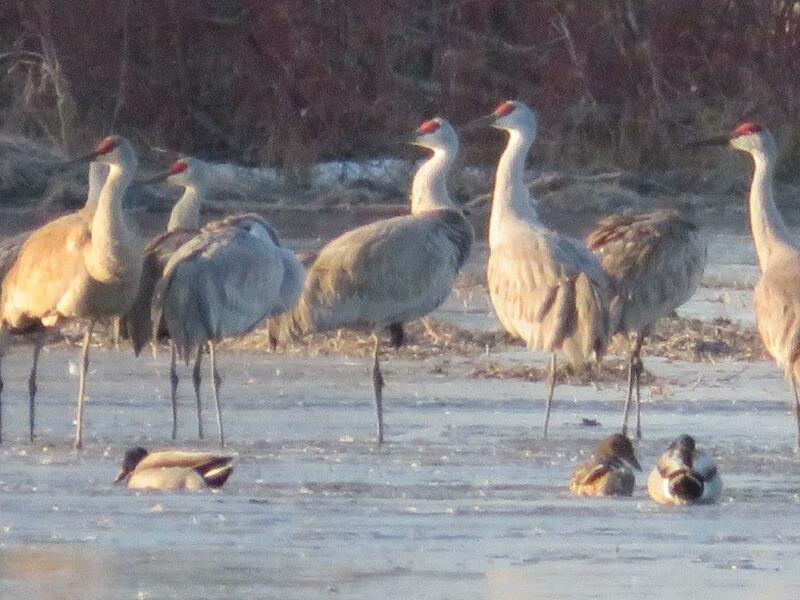 BE CAREFUL - Sandhill Cranes will aggressively defend the nest from all but the most persistent predators. When humans, dogs, or other animals approach a nest having eggs or young chicks, the parents may perform a diversionary display, moving away from the nest, with or without wing-spreading, and assuming a posture associated with intense aggressive threat. You and your dog will recognize the danger and with any sense at all, will not approach any closer. They'll nest somewhere, the goal is to have them nest where the colt and parents can't just walk out into the corn field to feed. As long as only one parent at a time flies out to the corn field (not walks), it might be okay to scatter them during the 8 days the corn is vulnerable, without danger of being bill-stabbed. BE AWARE - It's very likely a dog can't smell a setting crane. Ground-nesting birds have a uropygial gland on their back, at the base of the tail, they preen the oil all over themselves to conceal their scent from predators, primarily during nesting. The dog may have to see or hear a setting bird, she may not be able to smell them, once they're nesting. Thankfully, there's often too many easy geese in the way most places to distract the dog first anyway. 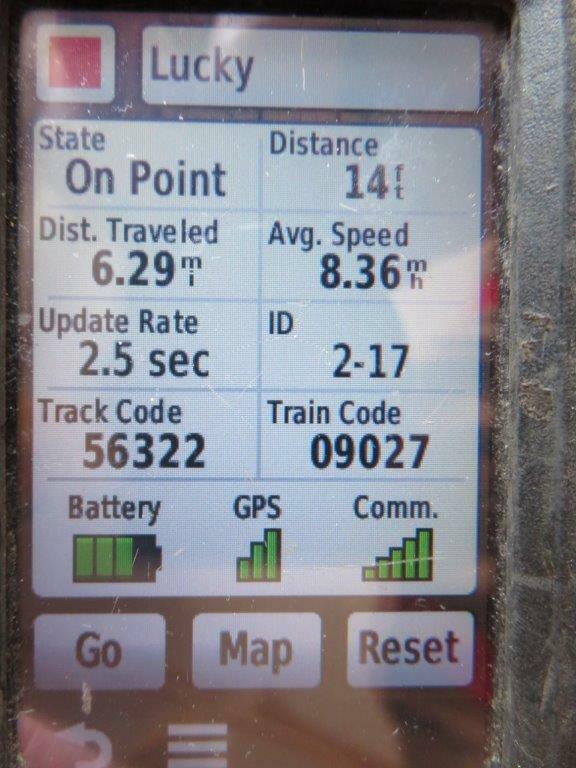 Even so, you might want a training and tracking collar on the dog, for immediate recall if necessary. That's also why haybines run over nesting turkeys, a ground-nesting bird's tactic is to avoid predators by staying quiet and camouflaged, even when the predator is within feet. Cranes do the same, except their nest is in standing water. Geese are a lot easier to flush and much less dangerous for your dog. Geese will often come back around and try to land several times, until they finally realize the dog isn't going to let them. 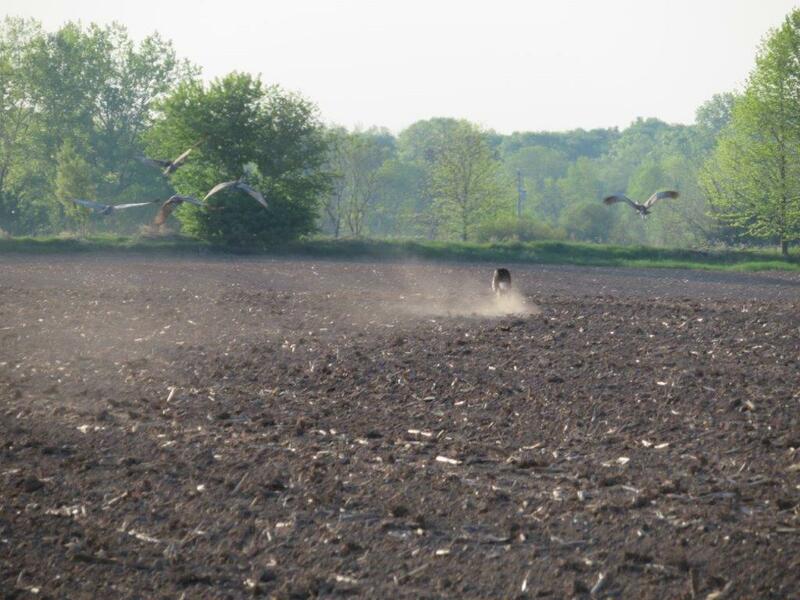 If you're are non-hunter, interested in using your high-energy dog to scatter cranes, join the club. Some dogs save elephants. Others save cougars, bears and wolves. These dogs save cranes.